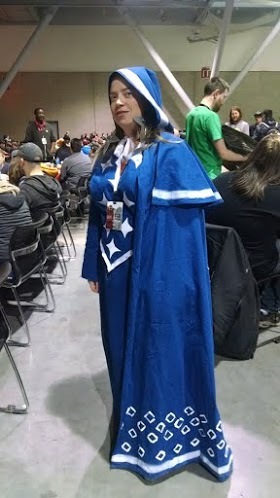 Me in my first ever cosplay as my favorite Iconic Enora, killing goblins* in the Pathfinder Society area at PAX East. Thanks to Lucas Servideo, one of the PFS Boston Lodge’s awesome Venture-Lieutenants, for the picture. * They were pretty unfashionable goblins, so I don’t feel too bad. Holy crap it came out amazing!!! You are a perfect Enora. Love it. She just needs some hairy Prada shoes now! awww… Thanks! Sadly furry Prada shoes and 9 feet of snow are a bad mix.